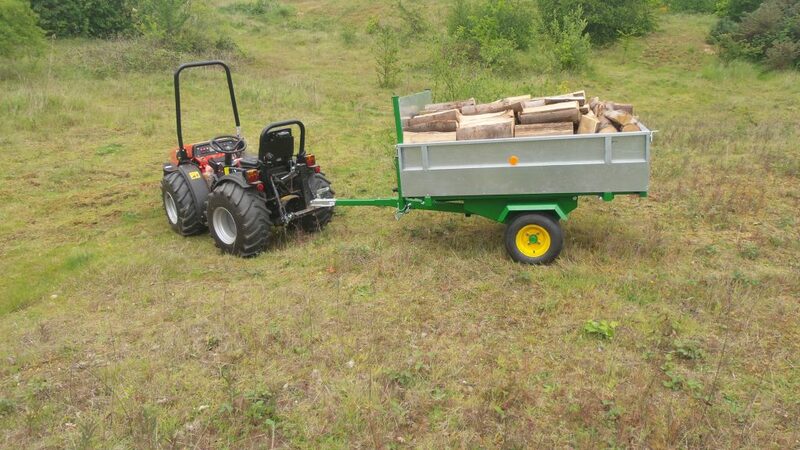 The general purpose trailer is suitable for small tractors, quad bikes, 4 x 4s, garden tractors etc. It is designed primarily for off road use. This trailer has low ground pressure tyres and so, is ideal for moving materials in sensitive areas, where a larger more costly trailer would be less practical. It is lightweight and so can easily be moved by hand when empty and is ideal for logs manure grass and most general goods. The trailer is strong enough to carry around a half tonne (600kg gross). The body sides and tailgate are of galvanised folded steel to resist corrosion and give maximum strength. It can be supplied with a ring or ball hitch and is fitted with a parking stand. A fixed headboard and removable sides and tailboard mean that the trailer can become a flat platform trailer in minutes. If tipping is required the trailer can be tipped manually, or with an optional mechanical or tractor assisted hydraulic tipping system. The body dimensions are L 1.57m, W 1.00m, height of headboard 0.7m, height of sides when fitted 0.37m. Overhaul length 2.9m Flotation wheel size 410X160.